Over a million young people around the world have signed the WYA Charter to join the World Youth Alliance. For each one, the charter gave them a beautiful vision of a society that defends and promotes human dignity. From becoming Charter members, many of them have become active WYA leaders by completing the Certified Training Program, opening WYA Clubs and Chapters, joining the Internship Program and other WYA projects including the Emerging Leaders Conference, Manhattan International Film Festival and the International Solidarity Forum. 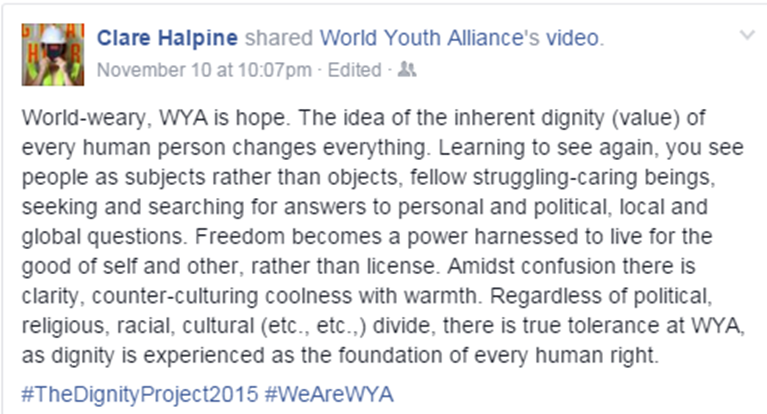 On the 10th of November 2015, World Youth Alliance released the new WYA video as part of The Dignity Project 2015 membership campaign inviting WYA members to invite their Facebook friends to become WYA members or friends. On the same day, WYA members around the world shared the video with their family and friends and gave reasons why they promote human dignity online. We invite you to join the campaign. Why do you promote human dignity? Here, WYA staff and members share why they promote human dignity. WYA also invites all WYA members and friends to add the WYA Twibbon to their Facebook profile photos to show their support to WYA and to invite more individuals to join the global coalition as WYA members or friends. Join the WYA family! You can sign the charter, too! This is one of the most common questions we get through email, social media, and even in person. We’re glad to see that so many young people are excited to start working with us! 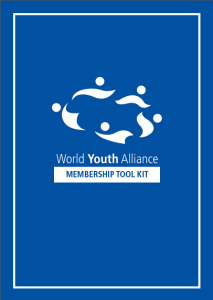 We pulled together this WYA Membership Drive Toolkit in order to give our members the tools they need to get started. It contains information about WYA, some membership materials and basic information about our programs. Read our full blogpost to learn how to get more involved with WYA.